A good example of why we need tests across the board, not just normal unit tests, but integration tests, and tests that are spawned as wide as possible, is the story of a authentication module that was developed as an re-factoring into a separate micro-service. When the module was developed, it contained a high degree of code coverage, in fact it had 100% unit test coverage. The problems arose when it went live, and several issues occurred. One of the original issues occurred because the new system was designed to improve the way the database or the passwords were stored. This meant that once it was fully deployed some of existing dependent services stopped working. 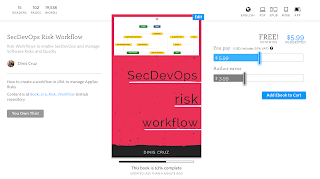 My current experience is that only GitHub and JIRA have the workflows and the speed that allow these risk workflows to be used properly in the real world. I know there are other tools available that try to map this and create some UIs for risk workflows, but I believe that you need something very close to the way developers work. GitHub and JIRA meet this essential requirement, as they are both connected to the source code. If you add links to risk as source code comments, you deploy a powerful and very useful technique with many benefits. When you add links to the root cause location, and all the places where the risk exists, you make the risk visible. This reinforces the concept of cost (i.e. pollution) when insecure, or poor quality, code is written. Linking the source code to risk becomes a positive model when fixes delete the comments. When the comments are removed, the AppSec team is alerted to the need for a security review. Finally, tools can be built that will scan for these comments and provide a 'risk pollution' indicator. One of the challenges of the JIRA RISK workflow is managing the open issues. This can be a considerable amount of work, especially when there are 200 or more issues to deal with. In large organizations, the number of risks opened and managed should be above 500, which is not a large quantity. 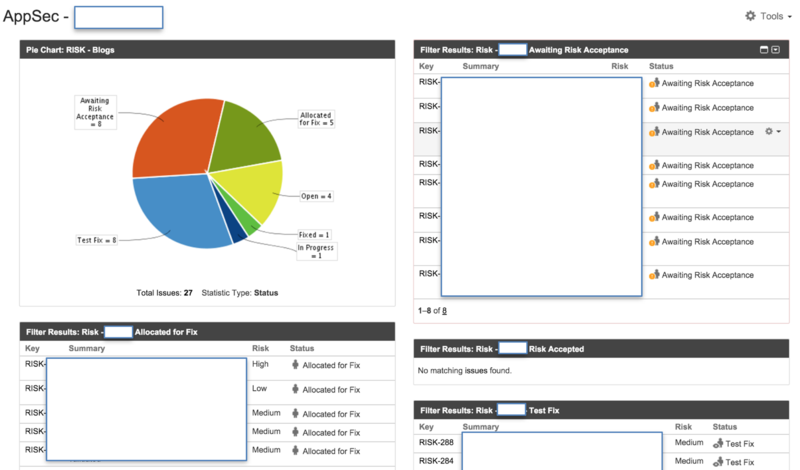 In fact, visibility into existing risks starts to increase, and improve, when there are more than 500 open issues. The solution to the challenge of managing issues isn't to have fewer issues. 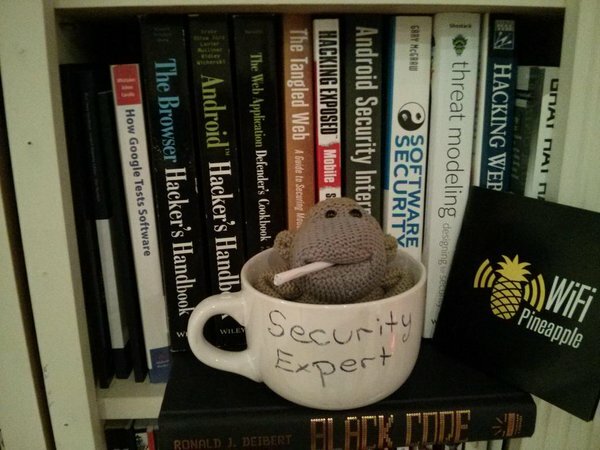 One lesson I have learned is that the mindset and the focus that you have when you do security reviews are very different than when you work on normal feature and code analysis. This is very important because as you accelerate in the DevOps world, it means that you start to ship code much faster, which in turn means that code hits production much faster. Logically, this means that vulnerabilities also hit production much faster. A key objective of pentest should be to validate the threat model. Pentests should confirm whether the expectations and the logic defined in the threat model are true. Any variation identified is itself an important finding because it means there is a gap in the company's understanding of how the application behaves. Creating and following a threat model for a feature is a great way to understand a threat model journey. First, take a very specific path, a very specific new feature that you are adding, or take a property, such as a new field, or a new functionality. The key to DevOps is feedback loops. The most effective and powerful DevOps environments are environments where feedback loops, monitoring, and visualizations are not second-class citizens. The faster you release, the more you need to understand what is happening. DevOps is not a silver bullet, and in fact anyone saying so is not to be trusted. DevOps are a profound transformation of how you build and develop software. DevOps are all about small interactions, small development cycles, and making sure that you never make big changes at any given moment. The feedback loop is crucial to this because it enhances your understanding and allows you to react to situations very quickly. When we talk about risk, workflows, business owners making decisions about development, and QA teams that don't write tests, we often hear the comment, "If we had good managers, we wouldn't have this problem". That statement implies that if you had good managers, you wouldn't have the problem, because good managers would solve the problem. That is the wrong approach to the statement. Rather, if you had good managers, you wouldn't have the problem, because good managers would ask the right questions before the problem even developed. The best model I have seen for integrating DevOps in a company is where teams are created that span multiple groups. Instead of having a top-down approach to the deployment of operations, where you create the central teams, the standards, the bills, etc., and then push it down, the central DevOps team hires or trains DevOps engineers and then allocates them to each team. The logic is that each team spends a certain amount of time with a DevOp engineer, who trains the teams in DevOp activities and best practices, and thereby embeds the best practices in the development life cycle. Once a program starts being placed, security champions will often give feedback that they are not involved in the workflows and decisions. The job of the security champion is to ask, "What is this? Do I trust this? What happens with this? ", but they often don't get the opportunity to ask these questions, because decisions are made without their input. To illustrate this problem, a situation occurred recently where the security champion started to create threat models across a product, and thereby managed to retroactively involve himself in some of the decision-making. When talking about risks, I prefer to use an pollution analogy rather than technical debt. The idea is that we measure the unintended negative consequences of creating something, which in essence is pollution. In the past, pollution was seen an acceptable side effect of the industrial revolution. For a long time, pollution wasn't seen as a problem in the same way that we don't see security vulnerability as a problem today. We still don't understand that gaping holes in our infrastructure, or in our code, are a massive problem for current and future generations. We are still in the infancy of software security, where we are in the 1950s in terms of pollution. David Rice gave a great presentation[^david-rice-pollution] where he talks about the history of pollution and how it maps perfectly with InfoSec and AppSec. Hi, we are in the final stages of choosing the date for the next OWASP Summit and it would be great if you chipped in with your preference. Please use the http://doodle.com/poll/e8d4p955rc8guuru doodle and join the other 44 participants. who should be at those workshops? what should the participants focus on? what should the be objectives/outcomes? If you have not been to an OWASP Summit before (i.e the 2008 and 2011 editions) please see below a great description of what they are (from an email sent by Abraham Kang on 6 Apr 2012). Although, I agree with Jim in spirit. I have to admit that I was able to get things accomplished at the 2011 Summit that would have taken longer had I not attended the Summit. I was kind of Stuck on the DOM based XSS cheat sheet because there were just so many existing ways and new ways of exploiting DOM based XSS. I was lost in trying to understand the exploiting instead of focusing on the Mitigating. The Summit gave me an opportunity to work with some of top guys ( Jim Manico, Stefano Di Paola, Robert Hansen, Gareth Hazes, Chris Schmidt, Mario Heiderich, Eduardo Nava, Achim Hoffman, John Stevens, Arian Evans, Mike Samuel, Jeremy Long, Dinis Cruz, and others please forgive me if I forgot to mention you) in Web security to get their ideas and refine mine. I also was able to bring up issues that were affecting adoption by large enterprises of OWASP materials with Jeff Williams and others. Finally, I was also able to meet the people interested in OWASP Web Development Guide (which I have been trying to reboot but having started a new job have failed to make much progress on) to discuss issues related to the guide and try to address them. All of this would have been impossible to do without the summit. I was also hoping to suggest that this year we try to bring other security members of the community that haven't traditionally participated (iSec Partners, Gotham Digital Science, etc.) in OWASP to the summit as I have great respect for those guys and think they could contribute greatly to the success of OWASP. The conference is viewed as being private but I thought it was open to anyone interested in contributing to OWASP. I think people would be willing to pay to attend a conference where they could speak to other leaders in informal meetings on topics of interest and provide the additional benefit of OWASP deliverables. We are a very disperse group, it helps to get people together to work things out, discuss and see the other people as human beings. I have to admit that the conference was also a lot of fun. I got to laugh with people I would have never had the chance to before this. Jokes don't seem to go over as well when they are made over email. I got to hear stories of (Larry's or Chris's -- the last names have been omitted to protect the Guilty) midget experiences/encounters. I got to know of other people skeleton's in their closets. This allowed all of us to bond in a way that couldn't happen without a conference like this. Another benefit of these types of interactions is that everyone that attended last summit was involved with an OWASP project (which may be a good requirement). I met Andras (my German brother) of WS-Attacks.org and although I haven't done a good job of it yet, I was hoping to reboot the OWASP Web Development Guide (I will send another email on that thread to explain my struggles) and see if I could use the content from WS-Attacks.org in the new guide (seeing as I did the translation revision for Andras) for the Web Services chapter. If I didn't attend the Summit I wouldn't have met him and made this connection. Yes there were a couple of things that could have been handled better related to the usurping of funds from individual Chapter's accounts and we probably could have spent less money on the incidentals but there is great value in the Summit. 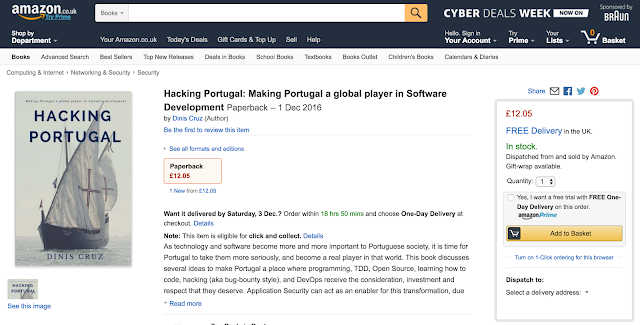 I just published the 'Hacking Portugal' book which is based on the "Hacking Portugal and making it a global player in Software development" presentation I delivered at BSidesLisbon in November 2016. Presentation "Hacking Portugal and making it a global player in Software development"
Description: As technology and software becomes more and more important to Portuguese society it is time to take it seriously and really become a player in that world. Application Security can act as an enabler, due to its focus on how code/apps actually work, and its enormous drive on secure-coding, testing, dev-ops and quality. The same way that Portuguese navigators once looked at the unknown sea and conquered it, our new digital navigators must do the same with code. 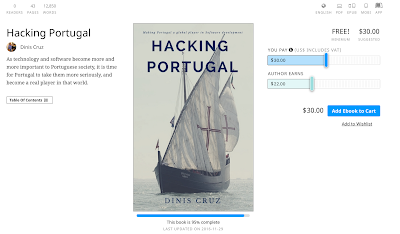 This presentation will provide a number of paths for making Portugal a place where programming, TDD, Open Source, learning how to code, hacking (aka bug bounty style) and DevOps are first class citizens. It is important have a good understanding of how a company's Risk profile maps to existing security standards alike PCI DSS, HIPAA, and others. Most companies will fail these standards when their existing 'real' RISKs are correctly identified and mapped. This explains the difference between being 'compliant' and being 'secure'. Increasingly, external regulatory bodies and laws require some level of proof that companies are implementing security controls. Lack of data should affect decision-making about application security. Recently, I looked at a very interesting company that provides VISA compatible debit-card for kids, which allows kids to get a card whose budget can be controlled online by their parents. There is even a way to invest in the company online via a crowdfunding scheme. I looked at this company as a knowledgeable person, able to process security information and highly technical information about the application security of any web service. But I was not able to make any informed security decision about whether this service is safe for my kids. I couldn't understand the company's level of security because they don't have to publish it and, therefore, I don’t have access to that data. 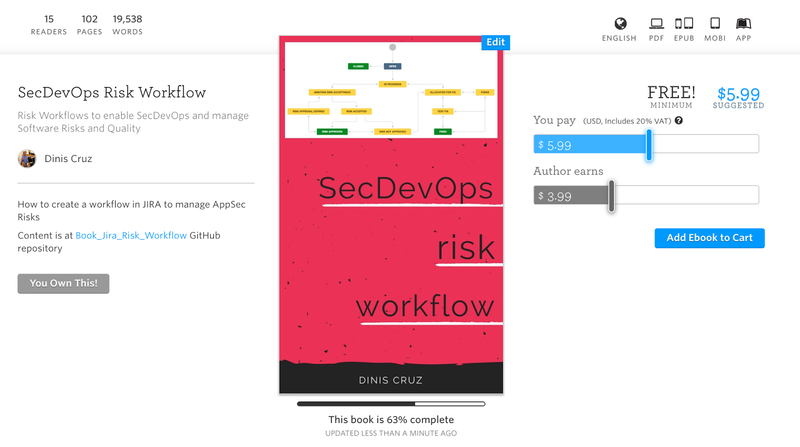 I just published version v0.65 of the SecDevOps Risk Workflow book. The diff for this version (with v0.63) shows 115 commits, 59 changed files, 545 additions and 355 deletions. One way in which cloud security differs from previous generations of security efforts, such as software security and website security, is that in the past, both software and website security were almost business disablers. The more features and the more security people added, the less attractive the product became. There are very few applications and websites that make the client need more security to do more business, which results in the best return on investment. What’s interesting about cloud security is that it might be one of the occasions where security is a business requirement, because a lack of security would slow down the adoption rate and prevent people from moving into the cloud. Accordingly, people care about cloud security, and they invest in it. A common error occurs when the root cause of newly discovered issues or exploits receives insufficient energy and attention from the right people. Initially, operational monitoring or incident response teams identify new incidents. They send the incidents are to the security department, and after some analysis the development teams receive them as tickets. The development teams receive no information about the original incident, and are therefore unable to frame the request in the right perspective. This can lead to suboptimal fixes with undesired side effects. what is the worst-case scenario for the application? what are you defending, and from whom? 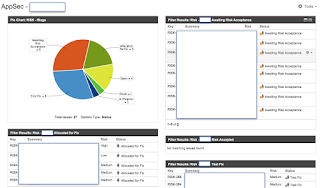 what is your incident response plan? Always take advantage of cases when you are not under attack, and you have some time to address these issues. It is vital that when a developer is looking at code, he can create tickets for 'things noticed' without difficulty. For example, 'things noticed' include methods that need refactoring, complex logic, weird code, hard-to-visualize architecture, etc. If this knowledge is not captured, it will be lost. The developer who notices an issue, and opens a ticket for the issue, will be unable to do anything about it at that moment in time, since he will already be focused on resolving another bug. When opening a risk JIRA ticket, it is essential to describe the exact behavior of that issue as a feature, rather than describing what you would like to see happening (i.e. your wish list). instead of saying 'application shouldn't be vulnerable to XSS or SQL injection', you should say 'application is vulnerable to SQL injection'. In this case, SQL Injection is a feature of the application, and while the application allows SQL Injection, the application is working as designed (whether that is intended or not is a different story). When we describe vulnerabilities, we describe features, because vulnerability is a feature of an application. For bugs and tasks, the smaller the bug the better. It is better to put them in a special JIRA project(s) which can be focused on quality or non-functional requirements. One of the biggest challenges in Agile and DevOps environments is the adoption rate of new technologies. To be as agile as possible, there is a tendency to adopt new technology whenever it appears to have an advantage. Common examples are cloud technology, analytic tools, continuous integration tools, container technology, web platforms and frameworks, and client-side frameworks. Lacking the time to perform 'root cause analysis', or not understanding what caused a problem, are valid risks in themselves. This is what makes them 'real', and what will motivate the business owner to allocate resources in the future. Specially when a similar problem occur. When you review applications as a security champion, you need to start by looking at the application from the point of view of an attacker. In the beginning, this is the best way to learn. You should start thinking about data inputs, about everything that goes into the database, the application, all the entry points of the application. In short, think about everything an attacker could control, which could be anything from headers, to cookies, to sockets, to anything that enters the application. Authorization is also a great way to look at the application. Just looking at how you handle data, and how you authorise things, is a great way to understand how the application works. Presentation - "Surrogate dependencies (poc in node js) v1.0"
Presentation "NodeJS security - still unsafe at most speeds - v1.0"
There is currently (late 2016) space within the application security world to develop a community focused on Threat Modeling. Such community would allow the many parties working on Threat Modeling to share information and provide a voice to all different stakeholders. An open source based business model that I really like, is the idea that the company (or team) behind a particular open source project, sells a fork of the master repository, that is customised and/or maintained for a particular customer. What that means is the customer buys access to a fork, from the authors of that particular code/repo/project. That way the company developing the application has a direct connection with the client, and a regular revenue stream. This is a great opportunity to generate goodwill and positive working relationships with developers. If the AppSec team is able to actually find the budget for tools, it will help developers be more productive. Inside a large organization, you will find teams where for some reason or another, management hasn’t seen as a priority to invest in tools for developers. Every type of data that exists in an organisation, especially the data that is consumed by applications, needs to have a Data Classification mapping. Developers need to know if a particular piece of data is sensitive, and what value it holds for the business. A good way to determine the expected level of confidentiality and integrity, is to ask what would happen 'If a particular set of data were to be fully disclosed?' (for example uploaded to PasteBin) or 'If some of the data was being maliciously modified over a period of months?'. For me a Unit Test is a test of an 'unit’. The only question is how big is that 'unit’. (i.e. every-type of automate-able test). For me, if you can run it with a unit test framework, then it is a unit test. That question makes all parties involved really think about what that database contains. Ideally, the correct answer is yes, there is no problem. All that data could go to pastebin because the data shouldn't mean anything by itself. One of the challenges of the JIRA RISK workflow is managing and maintaining the opened issues. This can be a considerable amount of work, especially when there are 200 or more issues. Note that, in large organizations, the number of risks opened and managed should be above 500, which is not a lot, and in fact, is the level when visibility into existing risks really starts to happen. The solution isn't to have less issues. When opening up a risk JIRA ticket, it is key to describe the exact behavior of that issue as a feature, versus how you would like to see happening (i.e your wish list). When you're reading an application security report (like a pentest), one of the most important questions that you should get an answer to is 'What tests did they run?'. This is especially important for the tests (i.e. exploits) they tried to run but were unsuccessful. The report(s) will show what was successful, but that's only half (or potentially less than half) of what you want to know. This is very dangerous because it is promoting the idea that it is OK not to test your code. And that is just crazy!